We offer a wide variety of dental services to our patients. Providing superior dental care for all of Orange County including San Clemente, Dana Point, San Juan Capistrano, Mission Viejo and beyond. Snoring? Unexpectedly tired? You may be suffering from obstructive sleep apnea. Learn how your dentist can help. Relax and conquer your dental anxiety with sedation. We can help you, no matter how afraid you are. We have 24/7 answering service to assist you in case of a dental emergency. Give us a call right away if you're experiencing a toothache. Welcome to our practice! We’re a full-service dental office located conveniently in downtown San Clemente, CA. Our philosophy is simple: Treat each and every patient like you would treat a friend or family member. Your oral health and well-being is our #1 priority. We strive to make sure that you receive the highest quality of care every time you visit us. 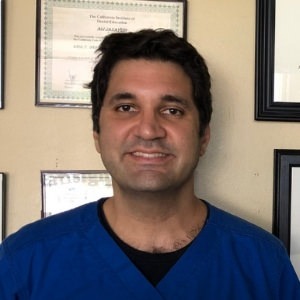 Our dentist is a highly skilled UCLA graduate with extensive training in critical patient care, implant dentistry and sedation “sleep” dentistry. Our staff is friendly, helpful and knowledgeable. They are trained to make sure that you feel comfortable and at ease from the minute you step into our clinic until the completion of your visit. This is why we use the latest in technology to offer the best possible customer service to our valued patients. For your convenience, we offer convenient Saturday hours and evening hours. For those who are interested, we offer affordable monthly payment options. We proudly serve the communities of San Clemente, Dana Point, San Juan Capistrano, Mission Viejo and the rest of Orange County. Call us today to make us your San Clemente dentist and get your healthy, beautiful smile back in less time than you’d imagine. Whatever your dental needs may be, we have a solution that fits your needs. We work with our patients based on what’s their priority and what their budget looks like. Our belief is every patient is unique and has certain expectations about the outcome of their treatment. This is why we always take our time to get to know to come up with a plan that best suits your needs. Do you want to enhance and beautify your smile? Then you’re most likely in need of cosmetic dentistry. We offer many cosmetic treatments including porcelain veneers, teeth whitening and Invisalign clear braces to help you achieve the smile of your dreams. Want to replace your missing teeth? With implant dentistry we can help you replace your missing teeth and broken teeth. Our implant services include traditional dental implants, implant-supported dentures, full mouth dental implants and all-on-four teeth. Plus, you can afford your dental implants for less than you’d imagine with our affordable, low-interest monthly payment plan options. Are you scared of going to the dentist? We specialize in helping scared patients concur their fear of the dentist with sedation. Basically, we put you to sleep and complete all of your treatment in just one visit. There is no case that is too difficult for sedation. In fact, we have had a 100% success rate in terms of completing planned treatment with our sedation patients so far. Ask us about sedation options if you are interested in learning more. Simply need a check up and cleaning? Our $59 new patient special includes a full exam, digital X-rays and a regular dental cleaning. If needed, we offer all phases of general and preventive dental treatment such as dental filling, crown, root canal therapy and tooth extraction. Get all of your dental treatment with us and save yourself needless referrals and unnecessary expenses. If you’re looking for a new dentist in San Clemente be sure to contact us first. We make sure every one of your visits is a memorable experience by offering the most exceptional dental care. This is why we keep our treatment plans honest and our fees affordable. Our goal is to help every patient maintain the highest quality of care possible. If you have any unanswered questions, feel free to reach out to us. We have 24/7 answering service which means we are always a phone call away. Reach us by calling (949) 481-2540, email us on our website or use the chat button in the lower right corner of our website for live chat support. We are happy to answer your questions and help you in whichever way we can. Better yet, come on in into our San Clemente dental office and meet us in person. We will be happy to discuss your questions and address your concerns in person. READY TO FIX YOUR SMILE SAN CLEMENTE? Give us a call to get started today. We promise that your smile transformation journey is going to be a pleasant and enjoyable one. Don’t delay essential dental care any longer as bad teeth won’t fix themselves! Call to schedule your appointment to see how easy and affordable treatment can be. You can reach us at (949) 481-2540 or book your appointment online. You can also come visits us at our San Clemente office located in downtown San Clemente. We proudly offer general, cosmetic and implant dentistry to the communities of San Clemente, San Juan Capistrano, Dana Point and the rest of Orange County. Meet our friendly staff and caring dentist who are always prepared to help you. Dr. J, Linda, Karen and Christine round out the team behind creating your beautiful and healthy smile. A UCLA graduate, with over 17 years of experience in dentistry, Dr. J can restore your beautiful smile in no time. Our patients love us! Check out what others are saying about their experience with Dr. J and his staff at Oceansight Dental. "Best dental experience I have EVER had! Support this dentist office 100%!! "Dr.J" has excellent bedside manner, his office staff is friendly, welcoming, & accommodating." "So I am in love with my new dentist. For starters, he saved me years of braces in favor of veneers which hey, look better anyways. The veneers came out absolutely flawlessly and I am a detail-oriented person so I definitely know how to give some healthy criticism." "Dr J. is an expert in installation of dental implant. It has been over 1 year now and my implant feels perfect. No one can even tell that its an implant tooth even tho its all the way in the front. Steady hands, confident through the whole process, puts your comfort as his priority. This was the first time anyone has worked in my mouth without me questioning if they knew what they were doing. Dr J is really one of a kind and you'll definitely love his work and attitude. I know I do!" Learn all about different dental treatments in our blog.